They're unassuming little bulbs. Tiny, gnarly, and brown, but with lots of potential. Oxalis deppei, also known as Iron Cross, is one of the easiest pot plants I know of. 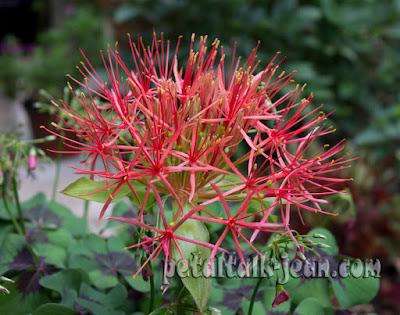 I ordered 15 bulbs from Easy to Grow Bulbs, and planted a few with a pot of recalcitrant Scadoxus multiflorus. Commonly known as "blood lily," Scadoxus is a South African bulb that has been growing and increasing in size since I got it four years ago. It's never bloomed, however. 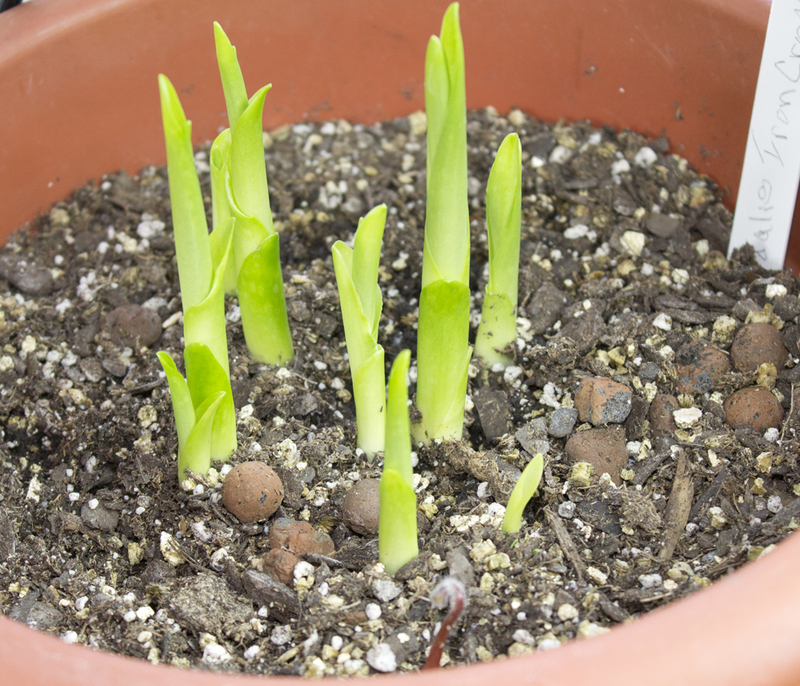 I searched for information about planting and getting this bulb to grow, and discovered conflicting recommendations about how deep to plant them--either with the tips of the bulb showing above the soil level, or buried at least two inches. I split the difference and just barely covered the tips of the bulbs. Healthy leaves of Scadoxus multiflorus last Sept. 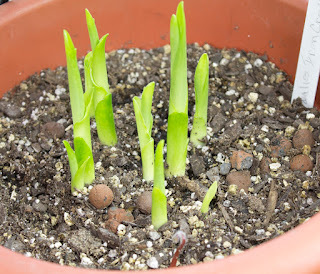 I rounded up all of the bulbs (they'd increased quite nicely), planted them in two separate pots (one plastic, the other clay) and kept them indoors under strict moisture-limited protocol. This spring, when I still didn't see any activity, I hedged my bets and planted some of the Oxalis bulbs in the plastic pot, figuring I'll at least have a pot of pretty leaves. The other Scadoxus pot I left alone. 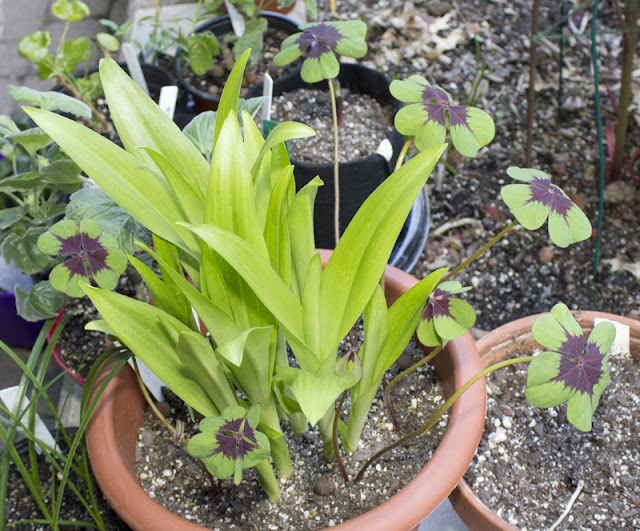 I also planted a few Oxalis bulbs in a pot with Eucomis (pineapple lily) bulbs, just to see what would happen. 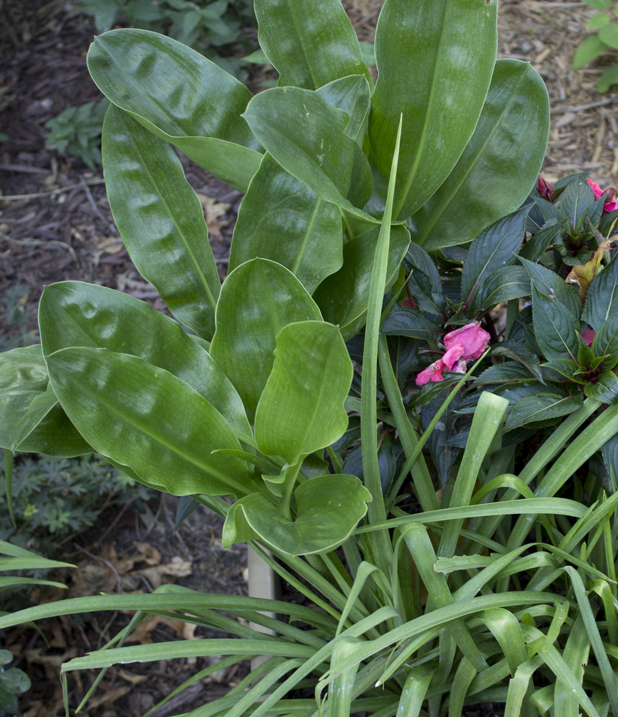 Scadoxus rises above the Oxalis leaves and flowers. 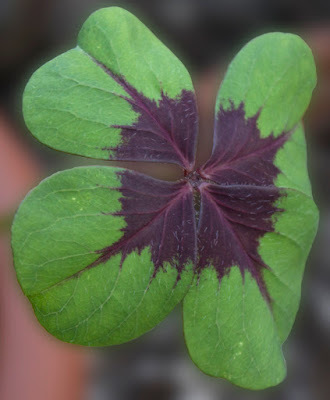 Just the other day, I was looking at what I'd come to think of as a pot of Oxalis with pretty leaves and cute little pink flowers, and I was surprised by the Scadoxus flower bud pushing up through the leaves. I searched through the thin stems of the Oxalis and found two more Scadoxus stems! Meanwhile, the other pot of Scadoxus seemed poised to do something, but at a sloth-like speed. 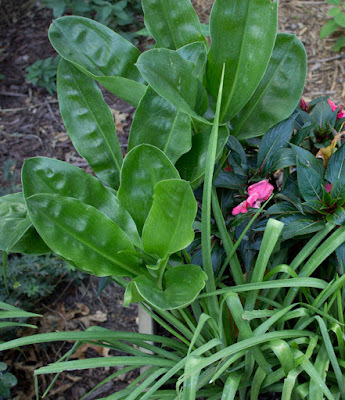 What I determined was that Scadoxus prefers some type of shade on its bulbs before it starts to grow. Alternatively, it was the additional care and water necessitated by the planting of the Oxalis bulbs that encouraged the Scadoxus to grow. I don't know if it will make a difference at this point, but I planted a Pelargonium and some hens and chicks in the clay pot with the slow Scadoxus. The upside to this exercise is that, if the slow pot blooms I'll have flowers all summer. 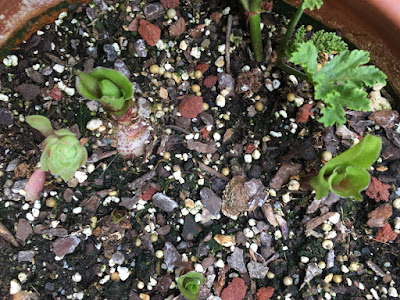 As it turned out with the Eucomis-Oxalis combo, the Eucomis autumnalis seem somewhat stunted. It was surprising, because the Eucomis seemed to be growing quite well until the Oxalis ran it over. 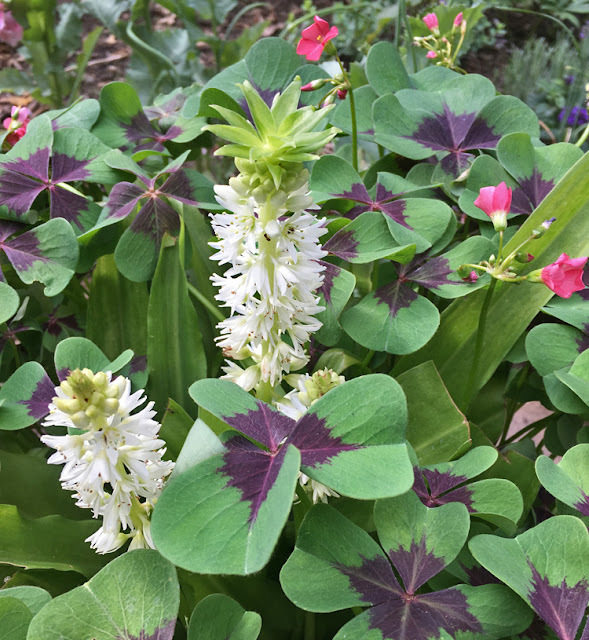 Next time, I'll either plant fewer Oxalis bulbs or leave the Eucomis to its own devices. Eucomis autumnalis barely grows above the fray of clover-like leaves. What pretty plants. I haven't seen these oxalis available around here. Maybe I haven't looked in the right nursery yet. Aren't plants fun to watch.